Hey everyone! This is somewhat an interesting second post for today. I was browsing through all the blogs I follow and came across PaperPlay Challenges. I saw the challenge for 'Autumn Leaves' and said to myself "oh, I should enter in this challenge". 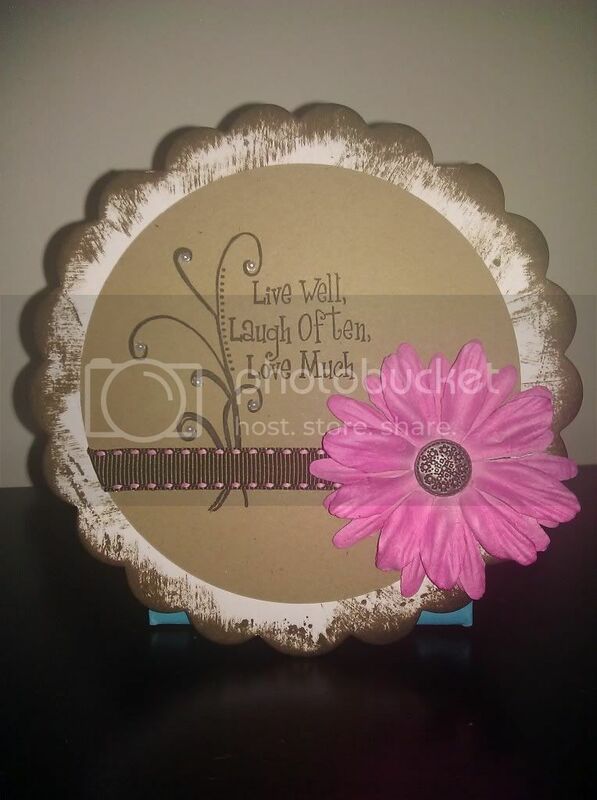 I totally made a simple little card that came to me! This 'post' was going to be for the challenge. Well that all changed real quick! I went back and looked again at the challenge, realized it was already closed! I really need to start paying attention to the dates!! So even though I can't enter my card in the challenge, I will share it with all of you! I kept it simple and 'warm' feeling. 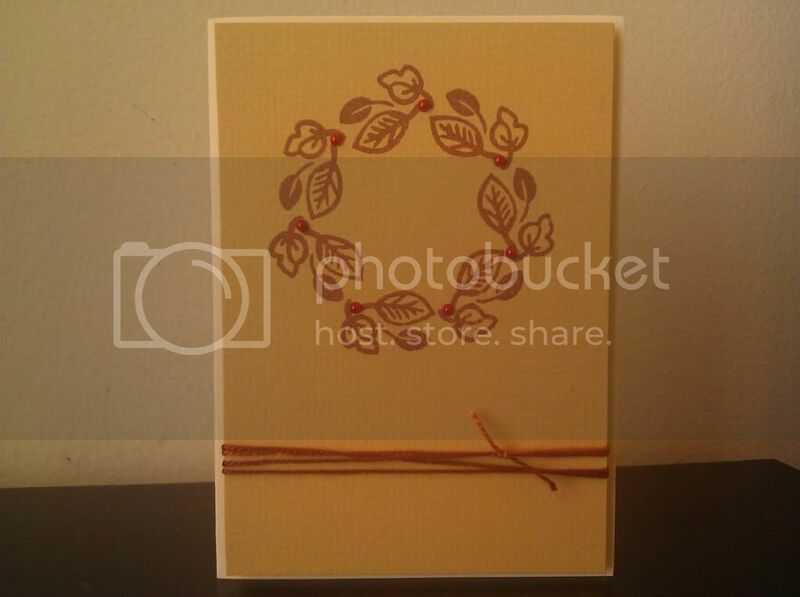 The wreath stamp is actually a little cluster of leaves and I just connected them in a circle. Greetings everyone! I just can't seem to get over these cute little frogs! Here is another card I made using them! Late last night while in bed, I had this idea for the card come to me. I actually got up and sketched it on paper to see if it would come together. 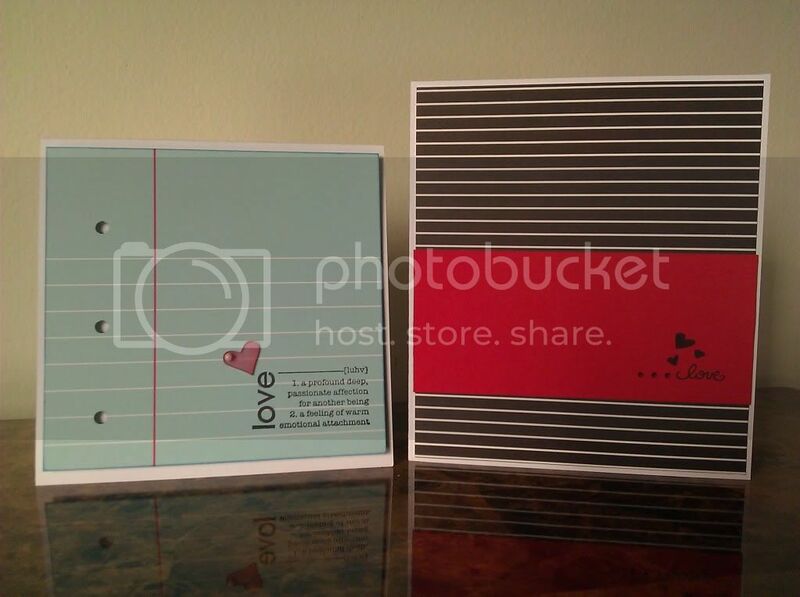 I was somewhat surprise that not only did it work on paper but ended up working perfect for the card! Usually, I always have to re-work my ideas until I get the outcome I was looking for. Hey everyone, again! This is my second post for today! I have another birthday right around the corner...these birthday's never seem to stop for me! So here is my birthday card, I kept and simple and tried a little something different. I have to say, I actually think it came out pretty good! :) I'm happy with and I think they'll be just as happy with getting it! Hey everyone! Hope you all are having a great week so far! 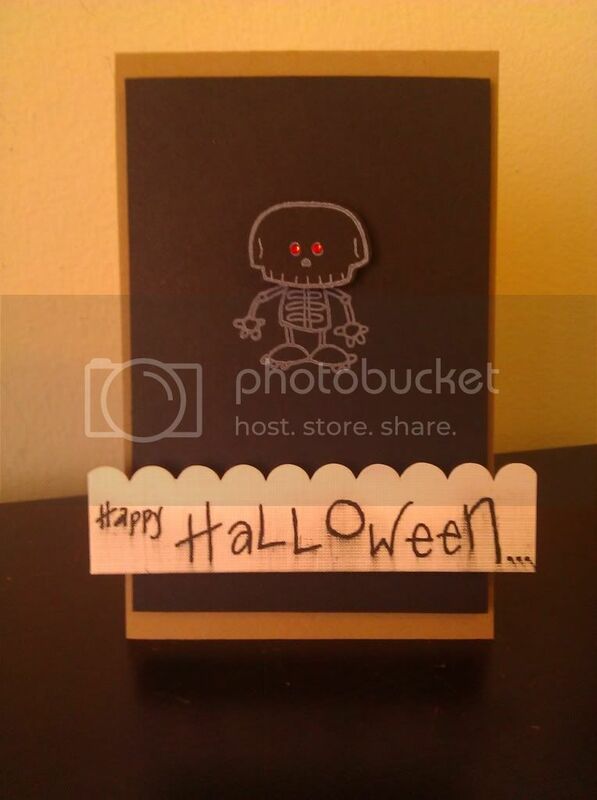 This is just a quick little Halloween card I did. I came across this stamp (out of a dollar bin at the craft store) and just thought it was too cute to pass up! Now, I must say I'm not 100% sure I like how I did my 'Happy Halloween'...I tried and thought of a few different things and I ended up using what I thought worked best. 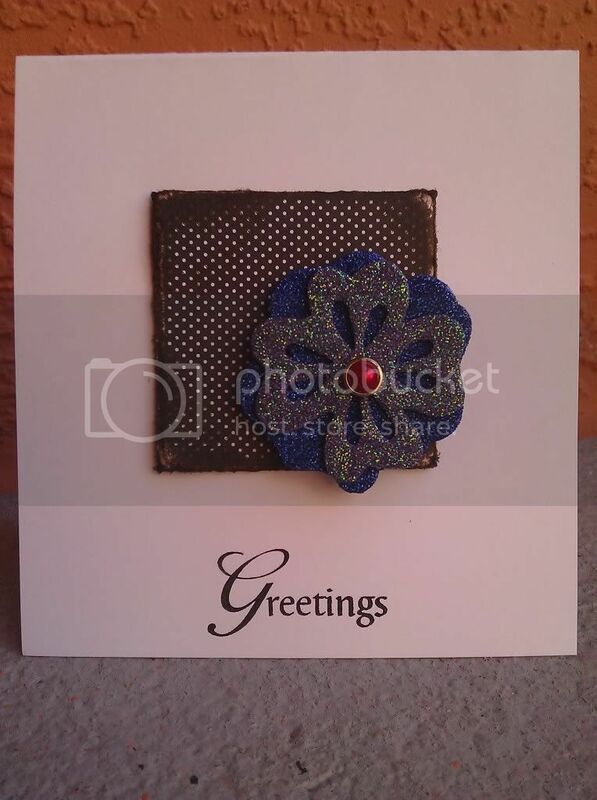 Also, on my black and white stripes card, the three little 'dots' are actually red rhinestones. 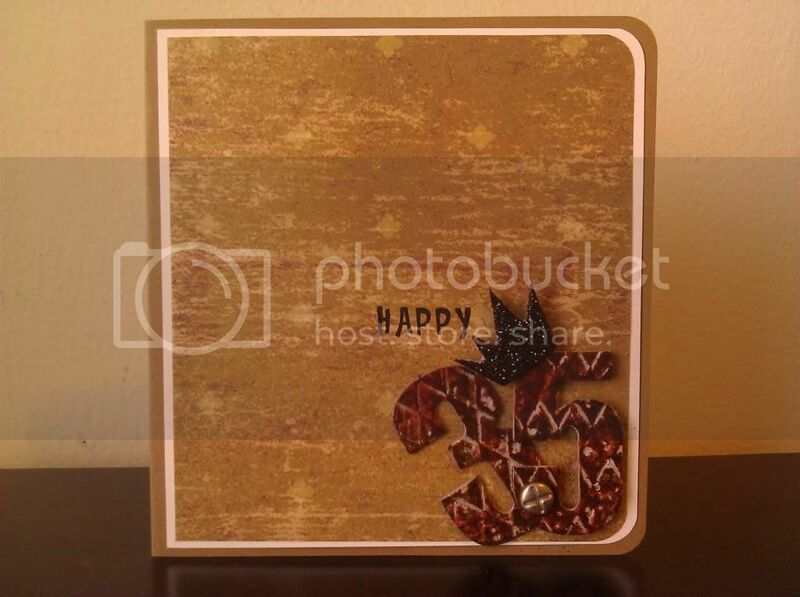 So here is one card I made up that I won't be sending off. 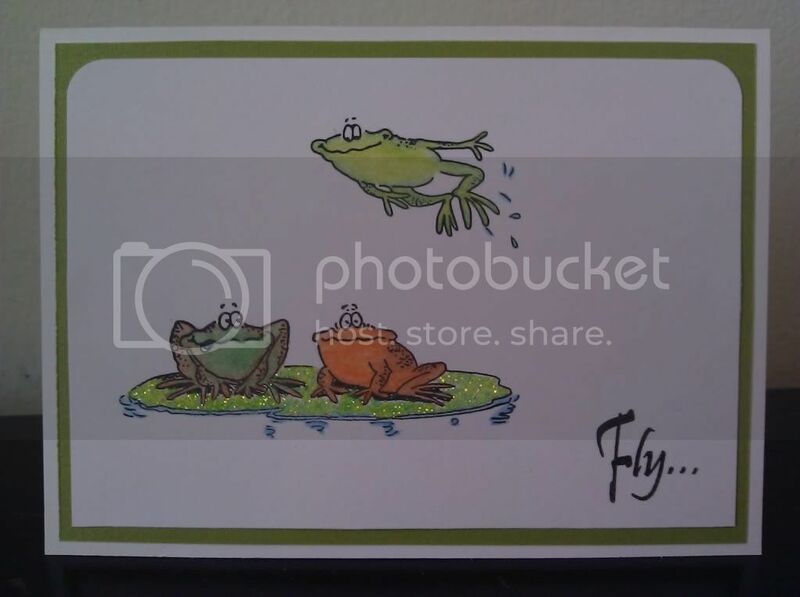 I was out and about shopping when I came across these cute little frog stamps! They are Penny Black~Toadily...don't you just love frogs! Hey everyone! It sure seems like forever since I did my last post, though it's really only been a few days. Things have been somewhat overwhelming for me right now! I had two of my kids sick, another two off the walls, I had a sore throat...I'm not sure how I'm managing to get through this week! So, I have another birthday that's this week and this is a quick card I made for them. This card really on took me 5-10 min. to make. Being I'm a little pressed on time right now, this is the best I could do. Thanks for stopping by today and enjoy the rest of your weekend!! Hey everyone! Hopefully your all having a great week so far! This week has seem to be nothing but birthday's for me. I should say month, I still have more! For the numbers and crown I used 'grunge board'. I used a couple different colors of ink and then sanded it some. I attached the numbers together with a 'screw' brad. For the crown I just decided to glitter it in black. Hey everyone! I hope your all having a great start of the week! This is just a last minute birthday card I put together (her birthday is tomorrow)! 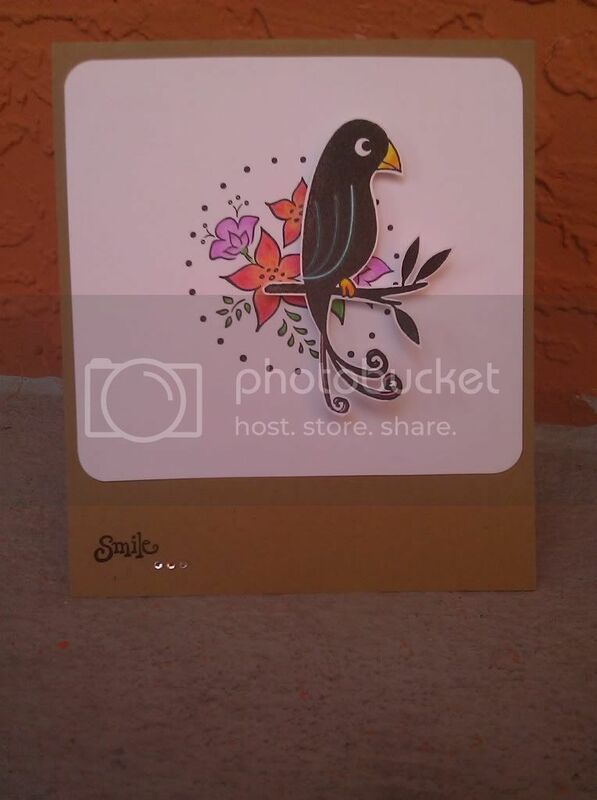 I used some kraft cardstock, used a piece of white cardstock. I had an Ice Cream punch that I used. Added some ink around my edges to match the paper. And of course, added a little cherry on top (in this case, a red pearl). 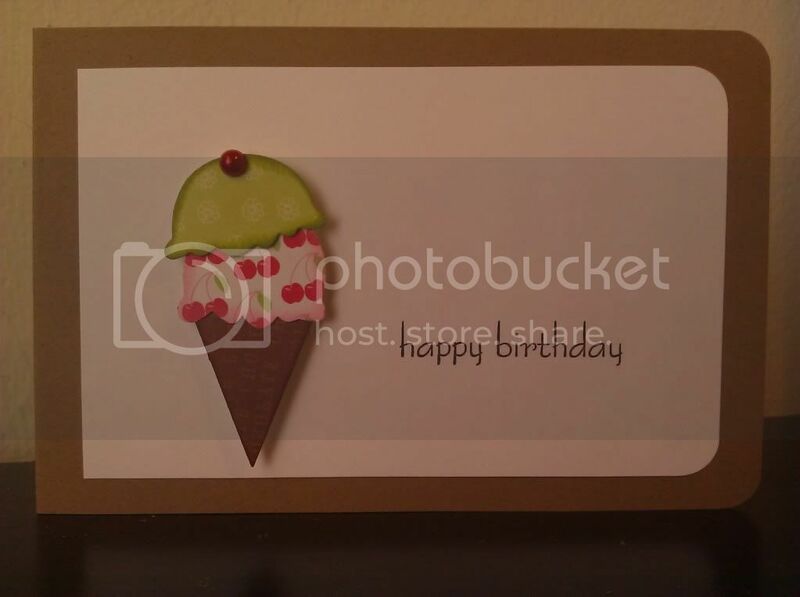 Supplies: kraft and white cardstock (recollections), pattern papars (dcwv-the glitter sweet matstack), red pearl (recollections), inks for ice cream and cone (rosebud, brown, moss green-colorbox), black ink (graphite black-brilliance), happy birthday stamp (I heart papers/mint motif-cake shoppe too! ), round corner punch. Greetings everyone! Well it's been quite the week for me! The past couple of days I've seem to come up empty handed when it came to crafting...until today that is! :) Yay! 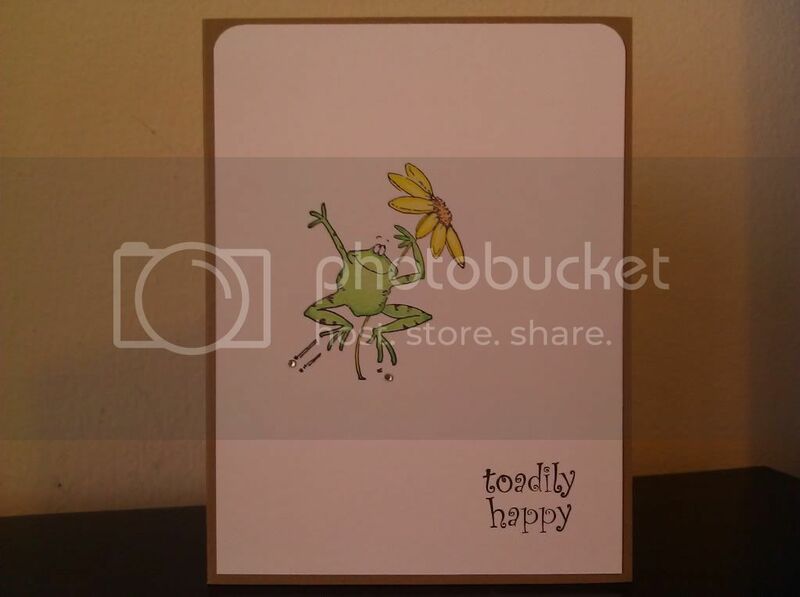 So this is just a cute little card I came up with. 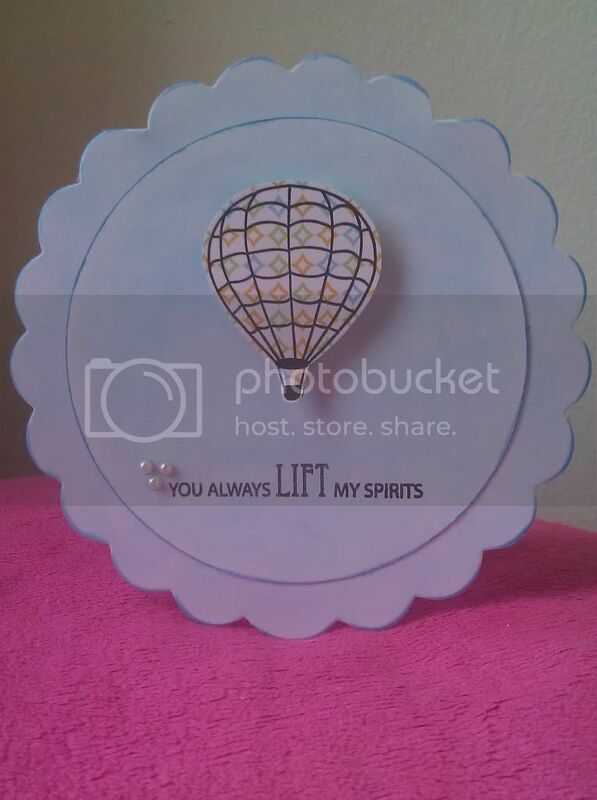 I happened to find these little scalloped shaped cards and decided to see what i could do with them. 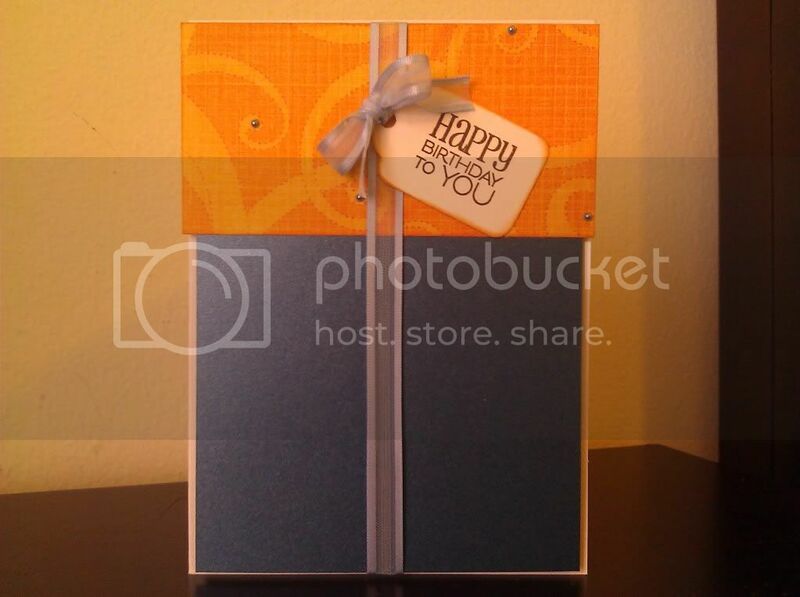 It was a little tricky for me at first because I normally don't work much with shaped cards. However, I think I ended up doing a pretty good job! Hey everyone! This is my second card for the day! Woohoo! :) I found out about the DeNami Animal Challenge and decided to give it a try! Here is my card I came up with. Again, keeping it simple but adding details. I wanted my card to look like a 'picture'. I just saw the movie RIO and this is somewhat how I came up with doing this card. If you seen the movie, you know that it's very colorful and of coarse tropical! 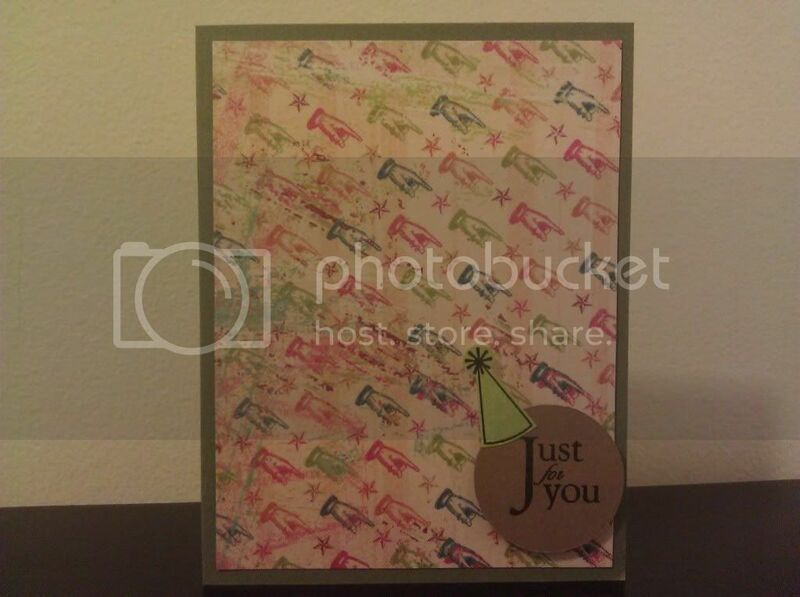 :) So with my card I used colors that I thought would stand out. All my coloring was done with colored pencils. The flower stamp and 'smile' stamp were both DeNami Design stamps. Okay, so this is my first card I made for the start of the day! I kept it simple, I wanted my glittered flower to be the focus. Glitter can be fun but why...why must it be everywhere? lol No matter how careful I try to be with it, I will always find it on my face, hair, clothes, etc...here, there, everywhere...even days later! :) Though it is worth it, isn't it? !